Hello and Happy Tuesday! Hopefully your week is off to a good start. 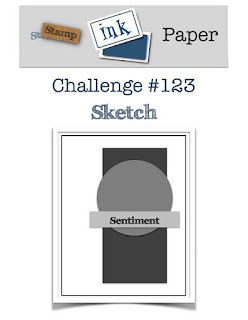 As usual on Tuesday I'm over at Stamp, Ink, Paper with my Challenge Card. This week is an awesome sketch by the talented Dena Rekow! I really love it and I'm sure you will too! Of course I'm back on my mission to get more Christmas cards done so once again I took this chance to turn a sketch into one of my Christmas Cards. I know that many of you make multiple of card designs. I hardly ever do that. I rarely duplicate any of my cards. Weird.. well yep, I guess so! It certainly takes me much longer to get my Christmas Cards done! So this time I used the Smitten Mittens Bundle along with some of the Quilted Christmas DSP. My color scheme was Real Red, Basic Black, Garden Green, and White which worked perfectly from Quilted Christmas DSP. The plaid banner behind the mitten was from the Christmas Around the World DSP.. I'm really loving plaids this year! 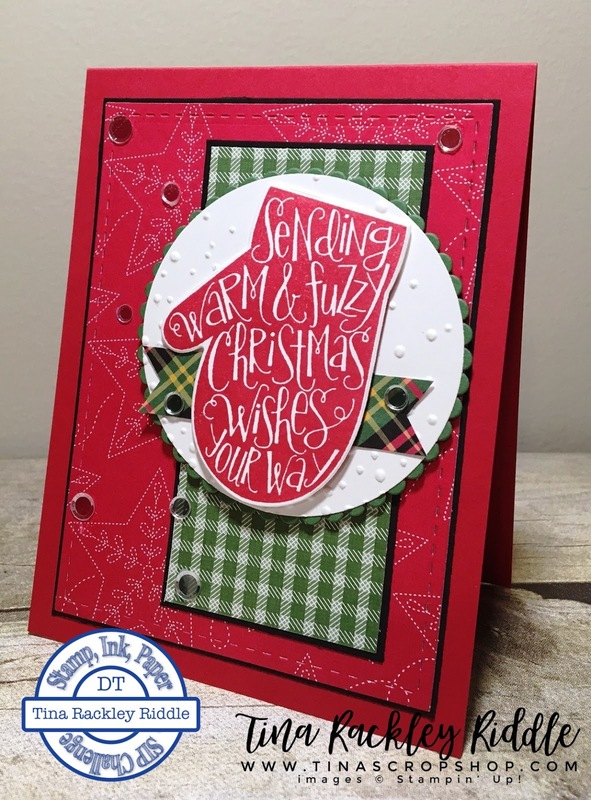 Labels: Christmas Card, Ink, Layering Circle Framelits, Lil' Inker Stitched Rectangle Dies, Paper Challenge, Quilted Christmas DSP, SIP #123, Smitten Mittens, Softly Falling Embossing Folder, Stamp, Stampin' Up! Cozy and colorfull, wonderful card, Tina!